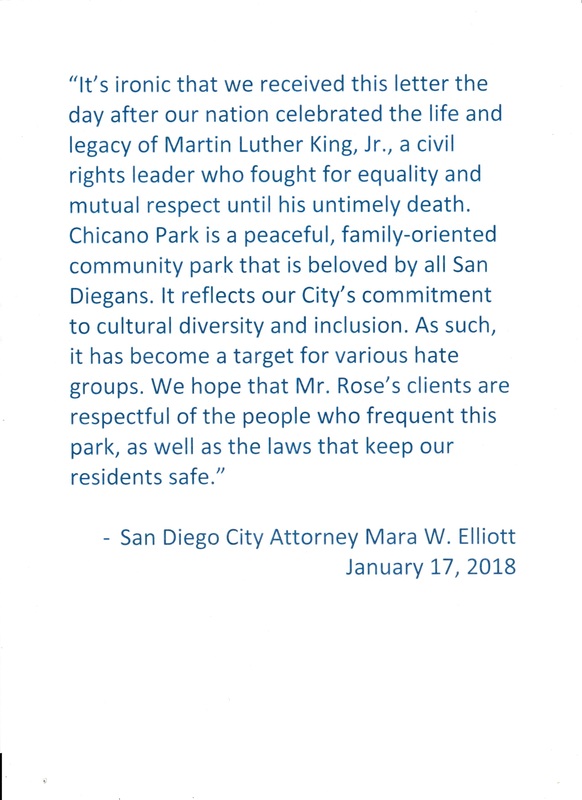 When our attorney, Ed Rose, sent a warning letter to the San Diego City Attorney, Mara Elliott, she released the following statement to the public. She did not reply to the attorney at all, which is not professional of her and is disrespectful to our attorney. She is implying that we are a hate group, including the attorney, because we think citizens and taxpayers have a right to visit a public park, have lunch and view the murals at the park, in order to have a critical discussion. She says it is ironic to get a letter from an attorney defending our civil rights on the day after Martin Luther King Day. That is very strange, because we thought Martin Luther King was all about defending civil rights. I guess, it is just our rights, which are not important. See the letter that evoked this weird response at the link below.